Since the spectacular collapse of the Minnesota Vikings' stadium on Sunday morning (Dec 12th 2010), I have been itching to find out exactly what caused the teflon and fiberglass bubble to burst. Or rip. I confess, I wasn't conscious of having ever laid eyes on the place before the news broke about the roof collapse, so I looked for photos to see just what kind of lid it had just a few hours earlier. It wasn't your typical roof - more a sturdy tent cover, with a billowing souffle type shape. So how does falling - or driving - snow stick to a hump-backed tent to build up enough to cause the whole thing to collapse? Wouldn't it mostly just blow or slide back off again? Why hasn't this happened before in its 28 year-old life? "Snow, high winds and bitter cold combined early Sunday to tear holes in the dome's Teflon fabric, causing the roof to deflate." Oh, so they've never had snow, high winds and bitter cold in Minneapolis before? And which one was it, incidentally, that caused the roof to burst - the snow, high winds, or bitter cold? I want to know! "Work crews Saturday used hot water, steam and shovels for several hours to clear snow off the roof, but were called down for safety reasons at 6 p.m. The snow and the wind made the going difficult". Hmm! Wouldn't hot water quickly turn to heavy ice in Saturday's temps? Anybody who has ever thought "I know! I'll just squirt boiling water into this really old car's keyhole and unlock it that way in these subzero temps!" can tell you why that doesn't work. "He denied suggestions that the hot water and steam had caused the roof's fall, saying that the Dome roof had survived such treatments in the past." I think they must've gotten lucky, or had the sense to de-snow the roof in above-freezing temps. "The big difference this time was that the mercury dropped low enough to turn the water hosed onto the roof into sheets of ice". Submitted by roadskater on Mon Dec 13 2010 11:59pm. Check it out starting just after 0:11 to about 0:13 in the video you linked. Out of nowhere (probably because some of the video was cut, a large dark object appears on the far sideline about the 35 or 40 yard line. I'm sure it's nothing so exotic, and probably is some kind of golf cart, maybe just a large person, but in my wild imagination it is a horse hoofing it out of there. I think you may be right that one of the workers or the process they were using (especially the water freezing) put too much stress on the roof. I wonder if they'll decide it would have been better to leave it alone. Either way, it sure is great nobody was hurt. It's a pretty cool looking stadium with no roof...like a very old coliseum style venue. Submitted by eebee on Tue Dec 14 2010 12:52am. Funny you noticed that! Several of the eloquent Youtube commenters mentioned seeing somebody running. Unless it was Usain Bolt, I don't believe anybody could run that fast. Somebody else mentioned an ATV of some sort. Yes, I love it when robots capture video of extreme weather events and nobody gets hurt. Submitted by timv on Tue Dec 14 2010 4:08am. I'll go with the ghost of John Berryman. "He loved the Golden Gophers but he hated all the drawn-out winters." Submitted by eebee on Tue Dec 14 2010 2:15pm. I remember watching a haunting bio of Berryman. You might be right - since he threw himself off the Washington Avenue Bridge (three miles from the Stadium site) in 1972, according to Wikipedia. Tragic. And what a painful way to end your own life. Submitted by roadskater on Tue Dec 14 2010 12:41am. OK. I thought I remembered that the Metrodome allowed inline skating during special sessions. Sounds like tons'o'fun to me. However, it's a long drive, and it's canceled due to "the roof situation." Wow it's about 700 yards a lap (they say 2.5 laps per mile). That is supersweet! They say there's something for everyone from the "needy to the speedy." Most love speedy, but wouldn't it be great if needy were a turn on? "Wouldn't this be a great world if insecurity and desperation made us more attractive? If "needy" were a turn-on?" Submitted by timv on Tue Dec 14 2010 4:20am. According to Wikipedia, it's collapsed before, three times in the first three years after being built, in fact. And this was reported as a near-record snowfall, 17" in one day being a lot even for Minneapolis. What's more, it's apparently a very wet and heavy snow. In some places this variety is called "heart attack snow," or so I've heard, because the weight makes it so strenuous to shovel, dangerously so for those who don't exercise otherwise. indeed, The Weather Channel this evening reported a number of cardiac arrests in that area today by men out trying to clear their driveways. Submitted by eebee on Tue Dec 14 2010 12:52pm. Well that really was a wet blanket of snow! I noticed in the flurries we had here in GA that although the flakes were very polystyrene-like (and I'm not talking about the lead singer of X-Ray Spex, either), when I grabbed a clump off my windshield it squished down to a dense, heavy ball. I had expected it to disperse like the graupel you saw some time ago. I tried to buffer my estimate of how long it's been since it collapsed. I noticed it was built in 1979 but not really opened until 1982. So probably more like 24 years than 28 years. Has it not snowed that hard and that much in Minneapolis in 24 years, though? I see the Carrier Dome in Syracuse has been deflated in anticipation of unusually heavy snowfall in the past - notably in advance of the Blizzard of '93. They ended up with 35" of snow within 24 hours and a total of almost 43". Phew! The above-linked article mentions that the Carrier Dome has a 'roof melting system', so I presume the Metrodome has one too. This I'd like to study (when I'm not supposed to be doing other stuff!). And second thoughts, how would 'deflating' the roof work? Wouldn't snow accumulate faster that way? Stay tuned for my next edition of 'Write Before you Google'. Submitted by roadskater on Tue Dec 14 2010 4:29pm. Since everything is connected to everything, just getting started is important. I would never have seen the apparition had you not linked the vid. I am different forever. I will always believe it's one of the horses that interrupted the Tour de France, a clip of which, I believe, was in the awesome movie, Amelie. No I'm not looking up links or facts! :o) Not until tonight at least. Submitted by eebee on Tue Apr 26 2011 10:22pm. Every time I have seen or heard the word "Identity" since 1978, I have had the X-Ray Spex song of the same name screaming through my head for the rest of the day. You just can't ignore Poly's voice! Unfortunately on occasion I felt it necessary to belt it out loud, regardless of who could hear. 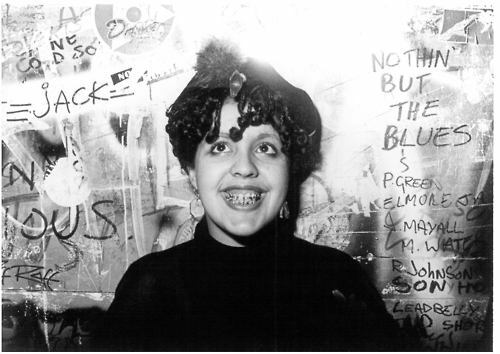 Seventies punk lead singer Poly Styrene died yesterday, aged 53, from cancer. This is how I will always remember her. Identity was my favorite X-Ray Spex single. Worse audio, but video from back then, typically as un-glam as it gets! Two and a half minutes of the wretched and dark late 1970s Great Britain. This is what the rest of the country's population looked like, that wasn't born royal :-). Submitted by roadskater on Fri Apr 29 2011 2:24am. Submitted by eebee on Fri Apr 29 2011 4:21pm. I think some Youtubers commented on the same thing the day she died. They said things like "Is that the same Poly Styrene I just heard on Public Radio today?!". Thanks for the links! Submitted by eebee on Tue Dec 14 2010 8:20pm. Which ones are band names and which ones are book titles? While I'm on the subject of bizarre band names, check out this comical Heavy Metal band name chart. Snicker. PS just noticed they spelled Led Zeppelin wrong, ironically under the Badass Misspellings section. More on the Horse Running with the Cyclists (Missed a Turn)! Submitted by roadskater on Wed Dec 15 2010 5:10am. OK looking at the Amelie segment made me want to watch that again, and since I own a legal copy with extra material available, I might just do that soon! And just plain crazy finish line madness! Danish more mysterious than French! Submitted by eebee on Thu Dec 16 2010 3:28pm. Thanks for the video links! The Remi Gaillard one at the end is disturbingly funny. That poor guy (with the helmet). He looked so perturbed, as if these goofballs were really messing up his hill-training. Good to hear all those accents too. The Swiss commentator was so guttural I thought she was Dutch. But no. That is German - just a very Swiss German. And if you thought spoken French sounded absolutely nothing like the written, try Danish! Back in the day (as I walked twenty miles to school in ten feet of snow) I was relieved to find out my Swedish au-pair friends couldn't understand the Danes either - even though the written languages are very similar. "I spent a year slaving over a hot rollergrill in a Metrodome concession stand..."
Submitted by timv on Wed Dec 15 2010 1:02pm. It's a trick question. They're all bands that named themselves after books! Submitted by eebee on Wed Dec 15 2010 5:44pm. Two of them are both :-) (Devil Wears Prada & Of Mice and Men). I started off just listing kids' books but included those two just for fun. My son was on a roll naming all these bands and they were so funny I kept listing them. The kids' books are Cup of Death, Mr. Popper's Penguins and Mysterious Benedict Society. The rest are band names. And I don't have a fist on that pulse, either, because I can't tell which band I'm listening to or even when it's a different song! I took my son and his best friend to the Dali exhibit at the High Museum in Atlanta recently. Not to come across like a total fuddy-duddy, I let them scream to their metalcore music all the way down there and all the way back for a major culture-shock experience. It truly was a blast - to the eardrums. For all it's worth, my son really got a kick out of the art exhibit. But I have no idea what or if different bands were playing in my car.